Everyone’s heard the old saying about the “third time’s a charm.” Well, by now most brokers are aware the IRS is now LOOKING BACK and enforcing the employer mandate by issuing penalty notification letters to applicable large employers (ALEs) suspected of noncompliance with the employer shared responsibility requirements during the 2015 tax year. This letter, also known as Letter 226J, is generally the first notification an ALE will have of its potential liability. When an ALE receives Letter 226J, one of the first calls typically made is to the employee benefits broker. Have you been on the other end of that call yet? While you can point your client to IRS guidance on Letter 226J and the response process, remain cautious about the role you play as the broker. Insurance agencies’ E&O policies generally do not allow the agency or broker to give legal advice. Attorneys or Certified Public Accountants who regularly represent employers in matters before the IRS would likely be a safer course of action. The ESRP knowledge is new to the advisor role and it is highly recommended one use someone specializing in this area as compliance efforts are enforced. 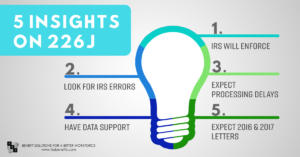 From our experience in working on 35 cases and $2.5 million in savings achieved for employers, here are the top five insights uncovered in corresponding with the IRS. Insight #1: The IRS will continue enforcing the employer mandate. The IRS identified about 33,000 ALEs as potentially owing employer shared responsibility penalties for the 2015 tax year. As of the date of the hearing, the IRS issued 10,000 proposed penalty notifications to ALEs. Of the 10,000 penalty notification letters sent, 3,000 cases had been settled with 82 percent of those settled cases resulting in the employer not owing any employer shared responsibility penalties primarily due to Form 1094/1095 reporting errors. When pressed by committee members as to why enforcement is occurring, considering President Trump’s executive order directing federal agencies to take actions that would ease the financial burdens associated with ACA compliance, Mr. Kautter revealed why enforcement is likely to continue. Essentially, his view is that the IRS has a constitutional duty to enforce current law, which includes the employer mandate. Mr. Kautter also explained the timing of enforcement when several committee members questioned the timing, given that penalty notification letters were issued as one of the last acts of outgoing IRS Commissioner John Koskinen. Kautter said due to delays in Form 1094/1095 filing for the 2015 tax year, the IRS did not receive the information it needed from ALEs until June 2016. At that point, and as noted in a Treasury Inspector General for Tax Administration (TIGTA) report, IRS systems experienced a series of technological issues preventing it from correctly identifying noncompliant ALEs. Additionally, Mr. Kautter confirmed that the IRS has experienced significant budget cuts and aging information technology systems, which likely contributed to the delay in enforcement as well. The bottom line here is that while we may continue to see pushback from some in Congress who oppose the employer mandate, the IRS will persist in enforcing this mandate while it remains current law. Insight #2: ALEs should expect administrative delays and hurdles. In representing clients before the IRS, administrative issues that delay the response process are common. For example, most ALEs request an extension of the response deadline, but may often find it difficult using the contact numbers provided in Letter 226J to reach an IRS representative who can grant that extension request and provide written confirmation. Another frustration occurs when a response to Letter 226J is submitted in a timely manner, but the IRS replies, using Letter 5040-J, that it has not yet received a response. While these administrative hurdles likely are here to stay, the most effective practice tip for ALEs is to document everything. When an ALE speaks with an IRS representative relating to an extension request, the ALE should document the representative’s full name and employee number, and request written confirmation of the extended deadline. Furthermore, the ALE will need to follow-up with the IRS regarding the extension request, as the IRS has been notoriously slow in response time. When submitting a response to Letter 226J, the ALE should always send that response via certified mail return receipt requested. This process will provide proof that can be presented of delivery documentation if a Letter 5040-J is received. In general, ALEs should expect a few complications, but they will always be better served by maintaining records of their contacts and correspondence with the IRS. 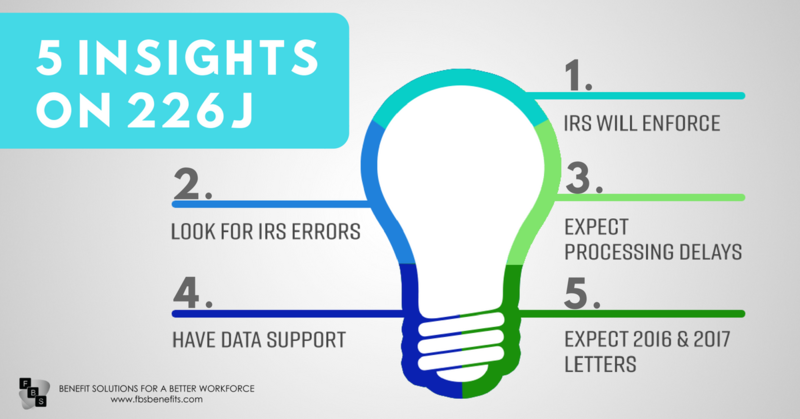 Insight #3: Identifying IRS errors can result in significant savings. Much of the focus on responding to Letter 226J has been on identifying the 2015 Form 1094/1095 filing errors that an ALE may have. In fact, as IRS Acting Commissioner, Kautter testified the clear majority of cases that have been settled with the ALE not owing any penalties relate back to ALE filing errors. However, ALE errors are not the only source of incorrect penalty assessments. Savvy ALEs often benefit from closely reviewing how the IRS arrived at the proposed penalty amounts. For example, the IRS continues to have difficulty correctly allocating the Section 4980H(a) penalty relief across aggregated ALE groups or control groups. As background, ALEs who are liable for penalties under Section 4980H(a) can disregard their allocable share of the first 80 full-time employees from that penalty calculation in 2015. According to Treas. Reg. § 54.4980H-4(e), an ALE member that is part of a control group calculates its allocable share of this Section 4980H(a) penalty relief for a given month based on the number of full-time employees it employed relative to the entire control group. For these ALEs, the ability to identify and present this error can result in a significant reduction in employer shared responsibility penalty exposure. Often, the challenge with presenting the correct allocation of the Section 4980H(a) penalty relief comes back to checking the accuracy of the monthly full-time employee counts reported on Form 1094-C. If the ALE was not correctly using the monthly measurement method or look-back measurement method in 2015, then those counts may require correction as well. There have also been situations where the IRS incorrectly proposed penalties against an employer who reported as a control group and certified to the qualification for transition relief from all penalties as an ALE with less than 100 full-time employees and full-time equivalent employees in 2014. Despite its previous filing, the IRS has been unwilling to accept those filings at face value. Instead, the IRS has insisted on the ALE proving that it satisfied all the conditions for this transition relief as part of its written response to Letter 226J. Clearly, ALEs should never assume that the IRS penalty calculations in Letter 226J are correct. Instead, ALEs should examine those calculations together with their 2015 filings to identify potential IRS errors that could result in reduced, or eliminated, penalty exposure. 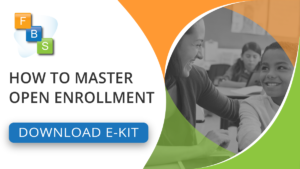 Insight #4: Benefits and payroll data control success. IRS error in assessing the ALE’s 2015 filings. Regardless of the source, the IRS typically will not accept the ALE’s correction requests at face value, even when the source is IRS error. There have been cases reported in which an IRS agent allowed a “corrected 1094-C” to just be faxed in, but as we have come to understand, this was a new agent without the rules of the game laid out yet. Instead, the ALE must justify those corrections and explain how the changes it is requesting comply with the IRS employer shared responsibility regulations, which will require in most cases an analysis of the employer’s payroll and benefits data. Reviewing data will be beneficial in most cases. The analysis often begins with the employees identified as receiving a premium tax credit (PTC) by the IRS, as only employees with full-time status under one of the IRS measurement method can trigger penalties. If that analysis still results in penalties, a more global assessment of the ALE’s monthly full-time employee count and benefit offering, if any, may be required. Even ALEs who were out of compliance with the employer mandate requirements (e.g., ALE only offered MEC plan that did not meet minimum value) will often find that this data analysis typically results in substantially fewer penalties. In short, an ALE’s access to accurate benefits and payroll data and the ability to present that data in conformance with the IRS requirements will control whether the ALE achieves a successful outcome. ALEs who can “speak the same language” as the IRS and have access to accurate data supporting its arguments will be in the best position to reduce penalties. Insight #5: ALEs should prepare for future enforcement efforts. Given the IRS position that it must enforce the employer mandate and the current lack of appetite in Congress for another attempt at repeal, ALEs should expect the IRS to continue enforcement efforts for the 2016 and 2017 tax years. ALEs can get ahead of future employer penalty notification letters by reviewing their 2016 and 2017 filings now and submitting any needed corrections. The IRS instructions for Forms 1094-C and 1095-C provide guidance on the correction process, but most likely ALEs will need to work with a third-party service provider in submitting any needed corrections with the IRS. By submitting corrections to past filings before receiving notification of potential employer shared responsibility penalties, the ALE can avoid the unnecessary costs and delays that inevitably come with the Letter 226J process. Overall, our take on the Letter 226J process is this – ALEs may experience a few obstacles that delay the process, but the IRS is generally willing to work with ALEs who can present data in a format that aligns with the employer shared responsibility requirements. Depending on the complexity of the issues and the amount of penalties involved, ALEs may need to work with an attorney or tax professional who can represent them before the IRS. Previous Can the Benefit Booklet Provided by Our Plan’s Insurer Serve as the SPD?